History: (What If? II#12) - When the X-Men and New Mutants visited Asgard and it came time to leave, Rahne Sinclair opted to stay. Cyclops agreed to put the decision to a vote, with the winning majority deciding whether to stay in or leave Asgard. Loki, in an attempt to gain the favor of Those Who Sit Above in Shadow, reversed his own edict and sent the losing majority home to Earth, while allowing the winning majority to stay in Asgard. While those returning to Earth drove the X-Men into a new era, many of those staying found new loves. Wolfsbane found love in the prince of the Asgardian wolves, while Rogue found love in Fandral the Dashing, of the Warriors Three. Cypher became a scholar, translating and reading scripts long dead in Asgard, while Cannonball married the daughter of the dwarf king, Eitri. Nightcrawler and Sunspot became warriors, while Mirage became one of the Valkyrior. With Thor away, trapped in the form of a Midgard frog, Loki opted to have Storm become the new Goddess of Thunder in his absence. Thinking the red-caped person to be a demon, Storm ordered the Asgardians to arms. A horde of warriors rode toward the red-caped person, with Sunspot, Rogue, and Nightcrawler among them. As the battle began, Volstagg the Voluminous searched for the Sword of Surtur, which he believed to be causing his daughter, Hildy, to grow sick. While he searched, the new Enchantress, Illyana Rasputin, discovered the pact made between Hela and Karnilla and began to summon aid against their truce. During the battle led by Storm, Loki ordered Storm to destroy the red-caped "demon," wielding the hammer of Thor. The two furiously battled one another until Hela intervened, attempting to gain the soul of Storm. Sunspot tried to stop her, but was disintegrated by a wave of Hela's hand. As Sunspot fell, Volstagg found the Sword of Surtur and suffered a dizzy spell, causing him to lean on a group of boulders, which fell on top of the Sword, destroying it. With the Sword destroyed, Loki could no longer draw mystic energy from it, and the red-caped "demon" transformed back into its true form of the mighty Thor. In order to stop Thor, Loki activated his contigency plan, which consisted of an army of giants from the east. Hela quickly reacted by calling forth her army of the dead and Karnilla called her Norn troops from the northeast. The three armies soon surrounded the Asgardian troops and a fierce battle ensued. 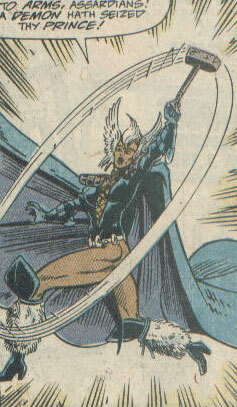 As Hela once again prepared to steal Storm's soul, Mirage stopped her hand by firing an arrow into it. Loki attempted to escape the battle, but was scooped up by Those Who Sit Above in Shadow. With Loki vanishing away unnoticed, the Asgardians were aided by the arrival of Cannonball and his army of dwarves. With the battle distracting the Asgardians, Karnilla attacked Illyana Rasputin, but was stopped by the arrival of Balder the Brave. The battle raged on for the Asgardians, as Wolfsbane and her wolf prince's forces entered the fray in favor of the Asgardians. As Storm knocked Hela to the ground, Karnilla called away her forces, just as Eitri the Dwarf King perished. Wolfsbane's wolf prince also perished in the battle, as Thor joined Storm and the Valkyrior in destroying Hela and her armies. After the battle was won, Thor renounced his claim to the throne of Asgard, in favor of allowing Storm to continue her rule. With Storm the new Queen of Asgard, Thor returned to Earth to rejoin his comrades in the Avengers, while Storm made Cypher her new Vizier. Cannonball became the new Dwarf King following Eitri's death, while Nightcrawler joined the Warriors Three, after Fandral the Dashing left to marry Rogue. Mirage became the new Goddess of Death after Hela's death and Balder the Brave assumed the throne of the Norns alongside his queen, Karnilla. While the wolf prince had perished in the battle, he left Wolfsbane with a three children, a wolf, a wolf-human hybrid, and a pure human child. As for Loki, Those Who Sit Above in Shadow made him ruler of the Nine Worlds, but at the end of time, so that Loki would only rule over a charred, ruined Asgard, heading for the center of a black hole. Comments: Created by Jim Valentino and Sam Delarosa. This reality diverged from the events in New Mutants Special#1 (1985) and Uncanny X-Men Annual#9 (1985). Sam Guthrie stayed in Asgard and married the daughter of Eitri, king of the dwarves. During the battle for Asgard, Cannonball led the dwarf troops against Hela's army of the undead, Loki's army of giants, and Karnilla's Norn army. After Eitri died in the battle, Cannonball was named the new Dwarf King and happily ruled with his expectant bride, Kindra. Douglas Ramsey stayed in Asgard and became a scholar, translating and reading long-forgotten Asgardian texts. 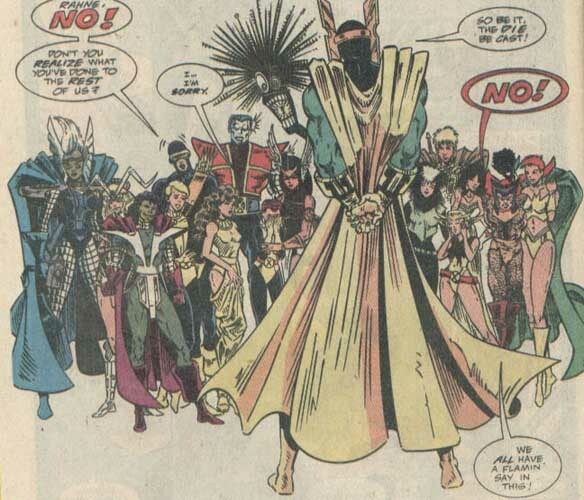 When Storm was crowned Queen of Asgard, Cypher became her Vizier. Due to his staying in Asgard, he was never killed by the Ani-Mator, like his Earth-616 counterpart. Eitri was similar to his Earth-616 counterpart, except for that he allowed his daughter Kindra to marry Cannonball. When Eitri participated in the battle for Asgard, he was slain. Upon his death, Cannonball was named the new Dwarf King. Illyana Rasputin, the mutant formerly known as Magik, assumed the role once held by Amora, that of the Enchantress. When Karnilla made a pact with Hela, Illyana discovered it and contacted the dwarves and wolves of Asgard. 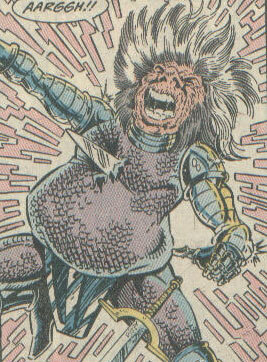 After doing so, she was attacked by Karnilla, who was stopped by the arrival of Balder the Brave. Danielle Moonstar remained in Asgard and became a Valkyrie. She aided in the battle for Asgard, shooting Hela in the hand with an arrow and eventually calling forth the other Valkyrior to aid in Hela's destruction. Following the death of Hela, Mirage became the new Goddess of Death and ruler of Hel. After Kurt Wagner opted to stay in Asgard, he became the swashbuckling warrior that he had already dreamed of being. After the battle for Asgard, Nightcrawler took the place of Fandral the Dashing in the ranks of the Warriors Three. Since Rogue stayed in Asgard, she was able to feel the touch of others without absorbing their powers and memories, although she did retain her superhuman strength, flight, and durability gained from Ms. Marvel. Finally finding love in the arms of Fandral the Dashing, Rogue aided him in the battle for Asgard and eventually married him. Storm remainded in Asgard and became the Goddess of Thunder in Thor's absence. Loki eventually used his influence on Asgard to make Storm the Queen of Asgard, so that he could manipulate her. When Thor returned to Asgard, he and Storm fought against one another until Volstagg destroyed the Sword of Surtur, which Loki was drawing power form. Her mind once again hers, Storm aided Thor in the battle for Asgard, eventually helping in the destruction of Hela using her Stormbringer hammer. After the battle, Thor opted to return to Earth and gave his throne to Storm, so that she might remain Queen of Asgard. Bobby DaCosta stayed in Asgard and became a well-known warrior. He gladly joined in the battle for Asgard, but was disintegrated by Hela, when he tried to save the soul of Storm. The mutant known as Wolfsbane, or Rahne Sinclair, became the lover of Hrimhari, the wolf prince. During the battle for Asgard, the wolf prince perished, but he left Wolfsbane with three children. The X-Men consisted of the mutants who decided to leave Asgard. 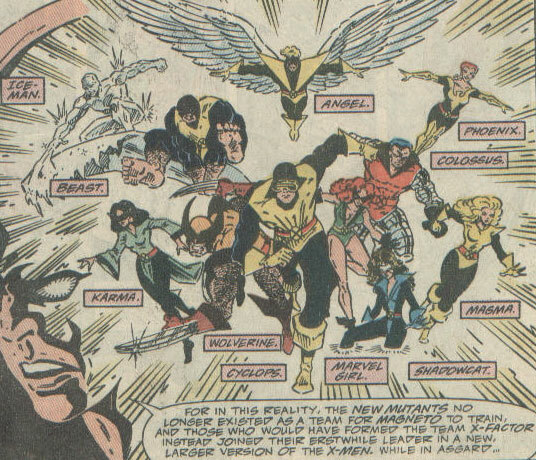 The team consisted of the Angel, the Beast, Colossus, Cyclops, Iceman, Karma, Magma, Marvel Girl, Phoenix, Shadowcat, and Wolverine. 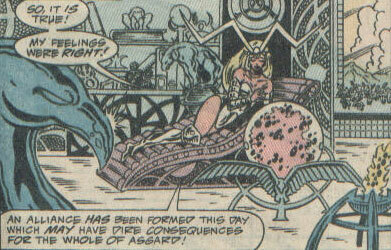 Their history after leaving Asgard was not much different than that of their Earth-616 counterparts.